← ‘You’re dead, you’re a joke,’ or: How should one respond to that image of a Pompeian who was struck by a massive piece of rock? Poetry and song do wonderful and – in the truest meaning of the word: awesome – things. They allow us to create entire worlds using nothing but words. Alternative worlds in which we may explore and experience what we are denied exploring and experiencing in real life. Worlds in which we may think the unthinkable. Worlds in which we shape our own fate and the fate of others. Poetry and song give shape to our hopes and desires, to our innermost feelings, but also help us to express, and to come to terms with, our concerns, worries, and deepest fears. 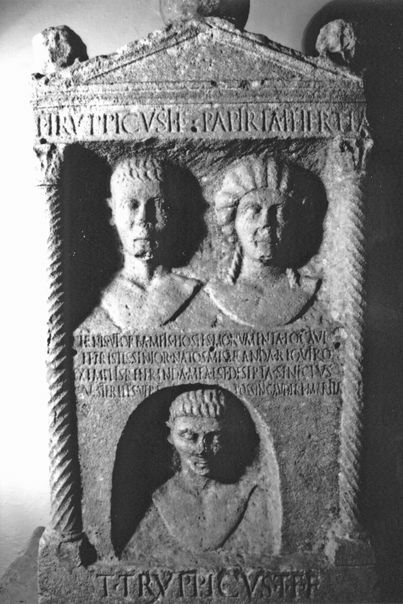 For Papiria Tertia, who lived in first-century A. D. Ferrara in northern Italy, her deepest fears and worries appear to have become a dire reality: all of a sudden, at an advanced age, she was bereft of her loved ones, when both her husband Titus Truppicus and their son, Titus Truppicus jr. died. Image source: http://db.edcs.eu/epigr/bilder/$OH_CIL_05_02435_1.jpg: © Center for Epigraphical Studies, Ohio State University. et tristis senior natos miseranda requiro. ut steriles vere possint gaudere maritae. And sad, of a rather advanced age, and pitiable, long for offspring. For the view that barren wives may truly rejoice. The final line of the poem seems to imply that she wished never to have had a child in the first place – a trope, of course, to cope with the loss of her child, inverting the natural order of parents dying before their children: it would have been easier never to have had a child, than to be blessed with one first, only to lose it to an untimely death. But in the second line she says something else: natos … requiro – ‘I long for offspring’, craving what is lost. The most remarkable aspect of this poem, however, has to be the phrase deserta senectus – old age, abandoned by those whom she loved (and who loved her back), orba meis, ‘bereft of my loved ones’. It does not require much imagination to gather the dire consequences that Papiria Tertia must have feared for herself in old age after the loss of her husband and, crucially, that of her son: who was going to look after her now, financially and otherwise? But there seems to be more than just the notion of (lack of) care that is implied in the expression deserta senectus. In addition to the feeling of abandonment and, related, the inability to rely on others, the expression seems to convey a profound feeling of isolation and detachment from meaningful social relationships and interaction. Papiria Tertia was not alone in that situation. Many a verse inscription implies fear of old-age loneliness and social isolation. functa piis cecinit nenia nostra modis. moribus atque bonis clara Sabina magis. semper crudescit nam mihi paene recens. haec graviora facit vulnera longa dies. quoque magis solus, hoc mage maestus ago. quod mala non cuiquam, non bona participo. si mala: ad exemplum tu mihi semper ades. dissimilis fueris; seu bona, quod similis. sed iuvenis iuveni quod mihi rapta viro. et dolor atque decus coniugis Ausonii. liquisti natos, pignera nostra, duos. nuntiet hoc cineri nostra favilla tuo. Thus far my dirge, fulfilling its sacred task, has sung in loving strains of those who, though dear, were mourned but in the course of nature. Now my grief and anguish and a wound that cannot bear a touch—the death of my wife snatched away untimely, must be told by me. High was her ancestry and noble in her birth from a line of senators, but yet Sabina was ennobled more by her good life. In youth I wept for you, robbed of my hopes in early years, and through these six and thirty years, unwedded, I have mourned, and mourn you still. Age has crept over me, but yet I cannot lull my pain; for ever it keeps raw and well-nigh new to me. Others receive of time a balm to soothe their grief: these wounds become but heavier with length of days. I tear my grey hairs mocked by my widowed life, and the more I live in loneliness, the more I live in heaviness. That my house is still and silent, and that my bed is cold, that I share not my ills with any, my good with any—these things feed my wound. I grieve, if one man has a worthy wife; and yet again I grieve if another has a bad: for pattern, you are ever present with me. Howe’er it be, you come to torture me: if one be bad, because you were not like her; or if one be good, because you were like her. I mourn not for useless wealth or unsubstantial joys, but because in your youth you were torn from me, your youthful lord. Cheerful, modest, staid, famed for high birth as famed for beauty, you were the grief and glory of Ausonius your spouse. For ere you could complete your eight and twentieth December, you deserted our two children, the pledges of our love. They by God’s mercy, and as you ever prayed, flourish amid an abundance of such goods as you desired for them. And still I pray that they may prosper, and that at last my dust may bring the news to your ashes that they are living yet. There is little – if any – consolation in the fact that old-age loneliness is an age-old ill of human civilisation. The two Roman poems are both, on very different levels, heartfelt, deeply moving expressions of pain, fear, and – worst of all – devastating helplessness and isolation. They speak of deafening silence. Of heaviness. Of frustration and anger, undeservedly (yet inevitably, almost unwittingly) taken out on others. To me, these texts are so much more than ‘merely’ historical documents. As poems, they are imaginations, they are conceptualisations: complex, immediate, and intense crystallisations of our human condition. They inspire awe – and fear. But in doing so, they also point towards the obvious solution. We all are aware of lonely people around us. When have we last spoken to them? Offered our support? Or a bit of our time? I’m not always good with that. Not as good as I should be. Or would like to be. I must try to get better. This entry was posted in Carmina Epigraphica, Poetry and tagged Abandonment, Big questions, Carmina Latina Epigraphica, Family, Food for thought, Humanity, Latin poetry, Latin verse inscriptions, Loneliness, Old age, Philanthropy, Poetry, Society. Bookmark the permalink.